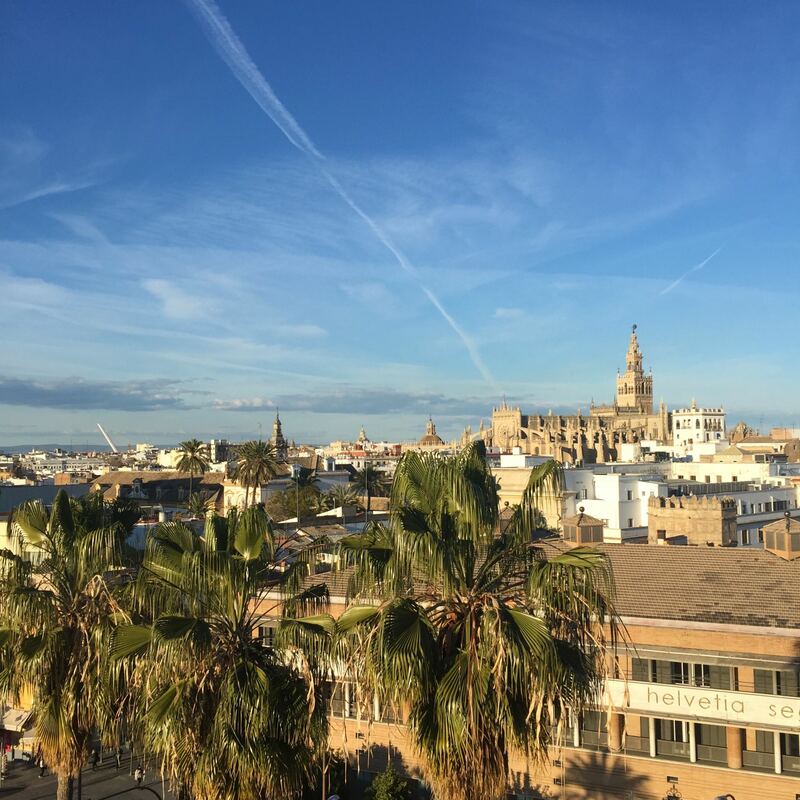 When I wrote about our winter weekend in Seville back in February, it was a real struggle to narrow all our photos down to just the few I needed for the post. 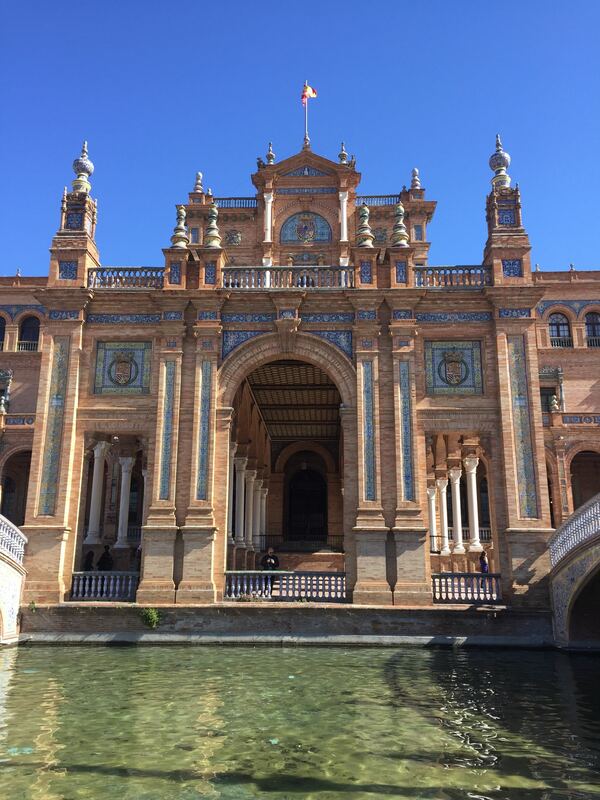 It was such a sun soaked holiday, and Seville is so full of beautiful sights to see (and photograph), I went a bit trigger happy with my phone, as Matt will testify. 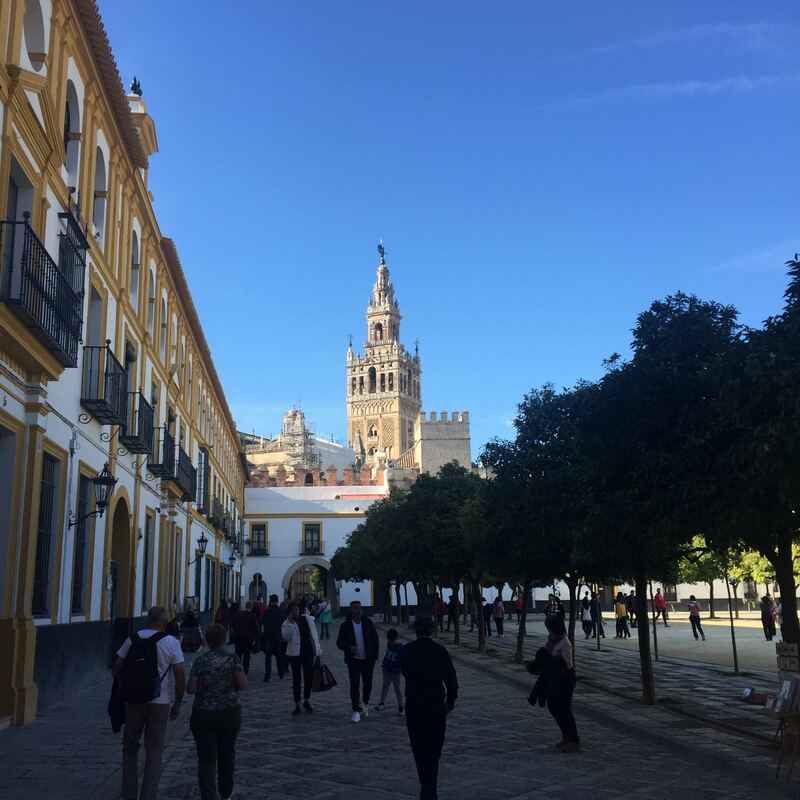 So I though, why not post a Seville photo diary? 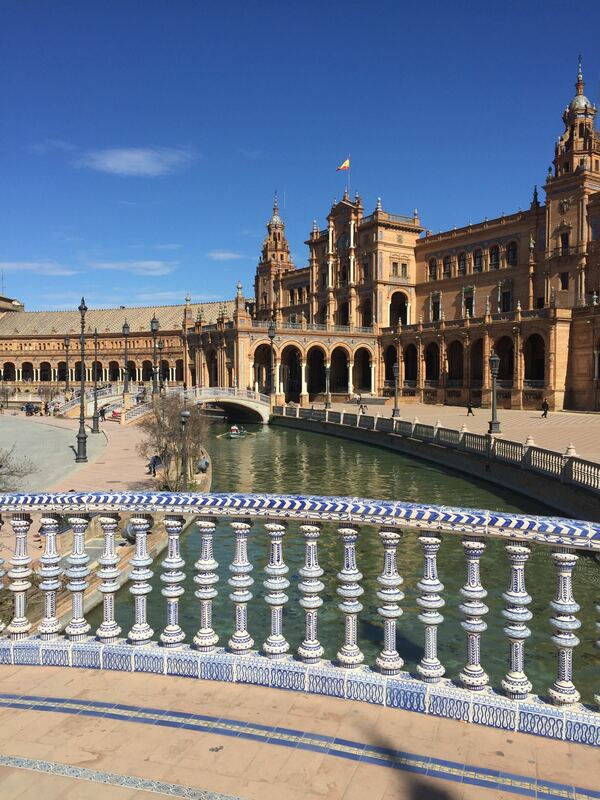 So here’s a selection of photos that hopefully show off what it’s like to spend some time in Seville. 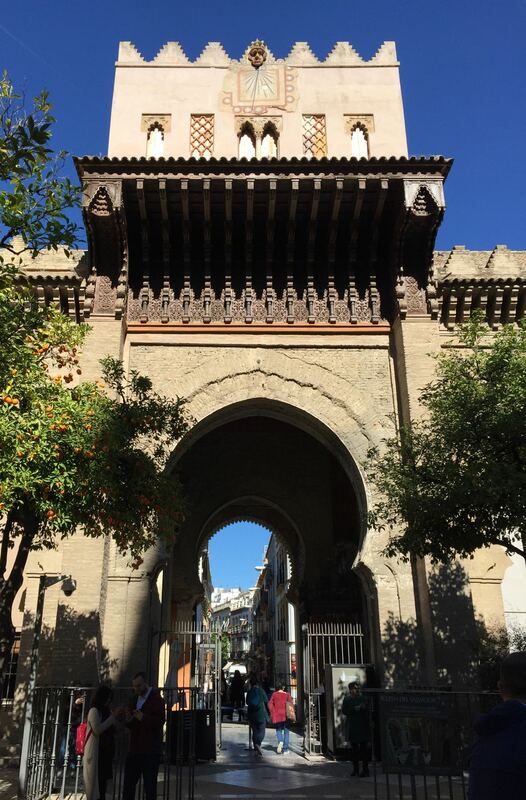 You’ll find colourful streets, amazing views, leafy parks and some seriously stunning architecture. 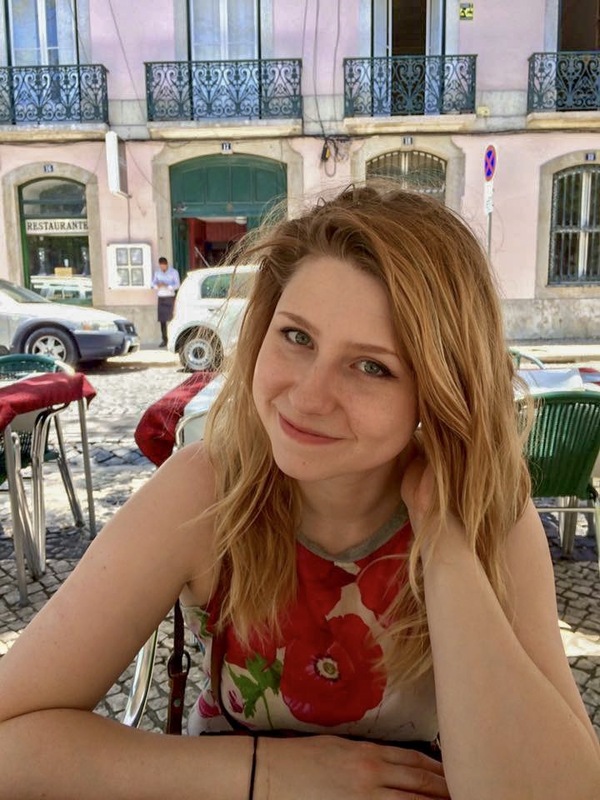 Each image is captioned so you can get some context for what you’re looking at, and sometimes some historical facts too. Enjoy! 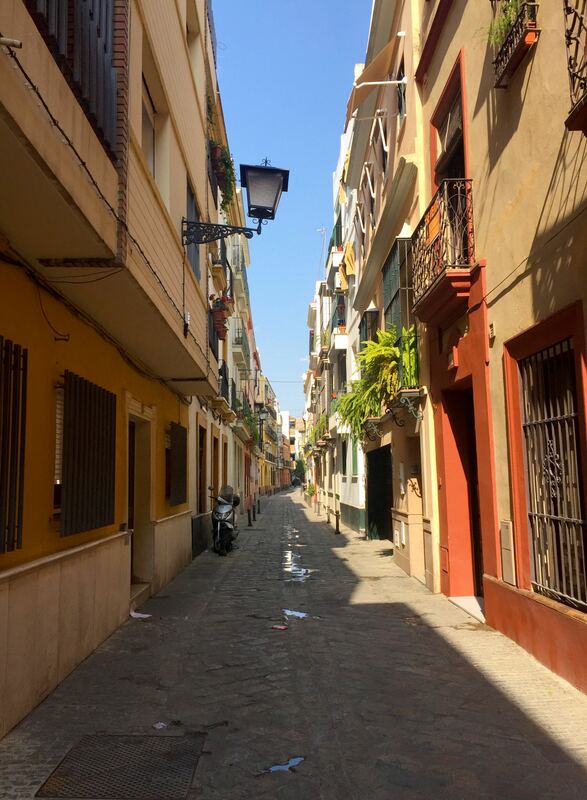 Calle Redes, the road where we stayed. 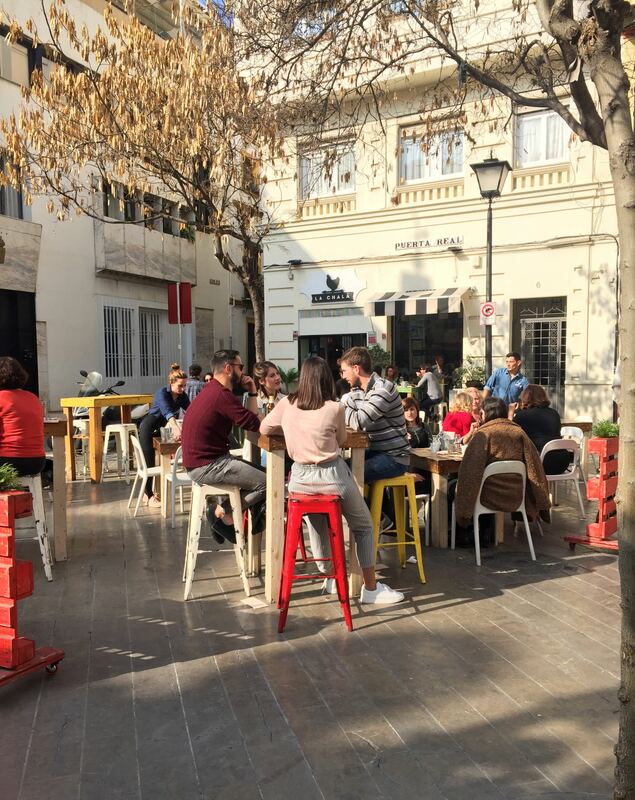 La Chalá Tapas Bar in Plaza Puerta Real rarely opens, but when it does the locals flock to it. 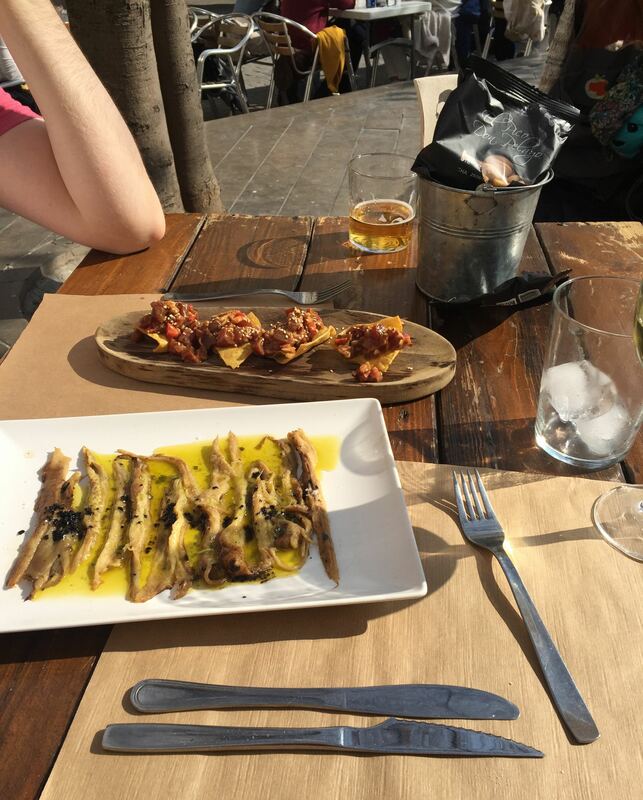 Smoked aubergine in lemon infused olive oil, and tuna tartare tortillas. 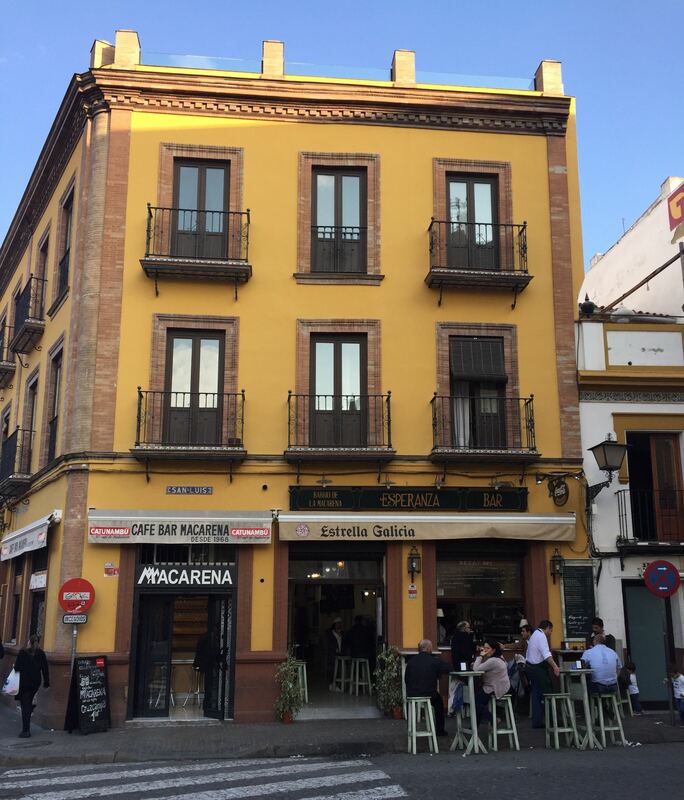 Tapas bars across Seville spill out onto streets and squares. 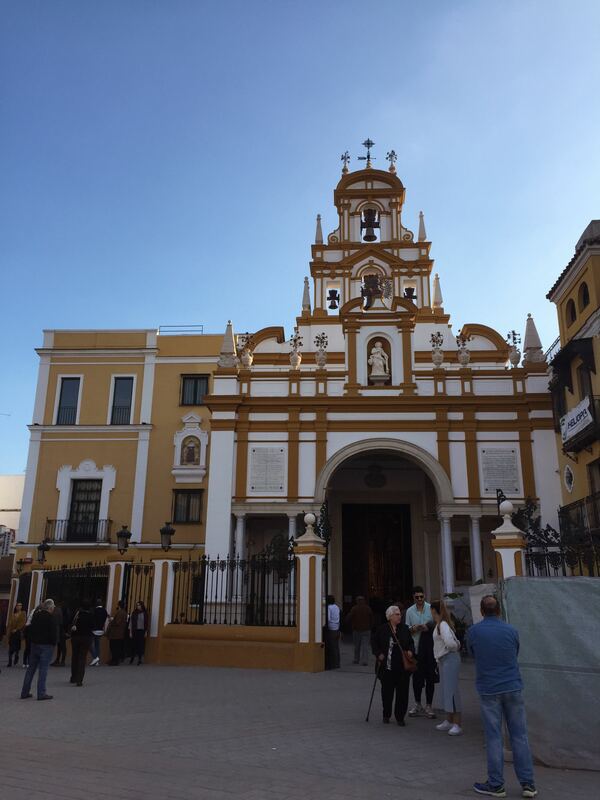 Basílica de la Macarena, famous for housing The Virgin of Hope. 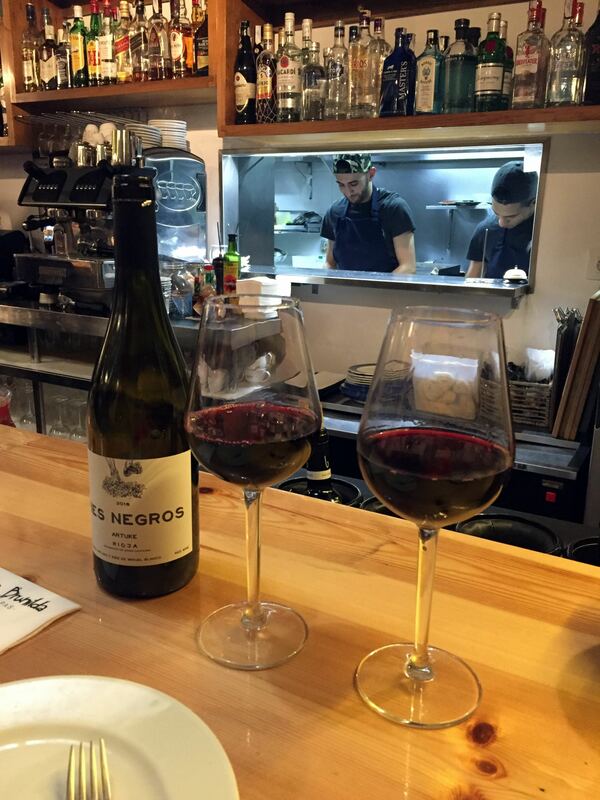 How much do you want to step through the screen right now and have a glass of wine? 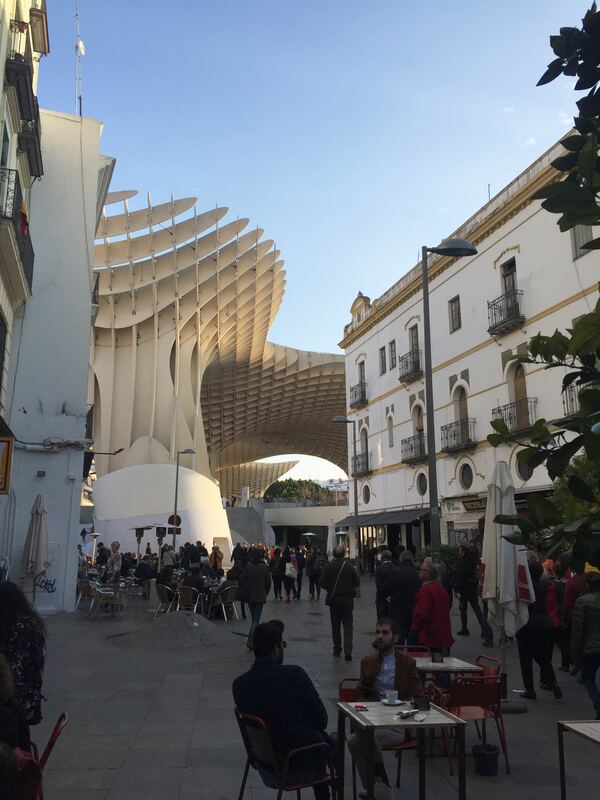 The Metropol Parasol seen from street level on Plaza de la Encarnación. 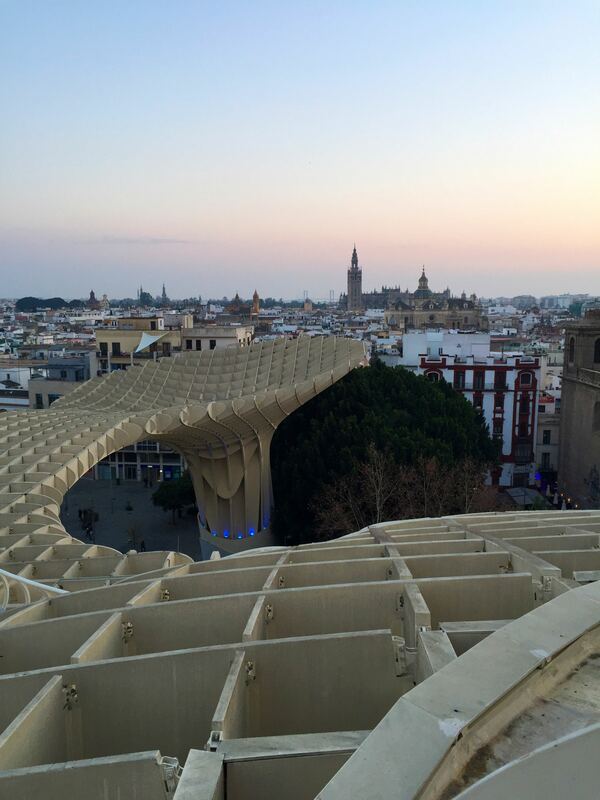 The Metropol Parasol is 26m high, the largest wooden structure in the world. 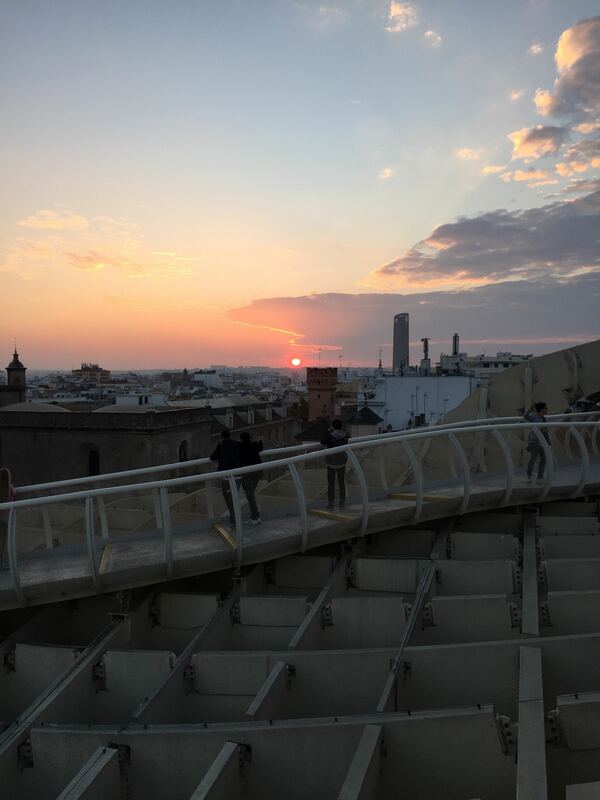 You can buy tickets to go up in a lift to the platform where you can walk around. 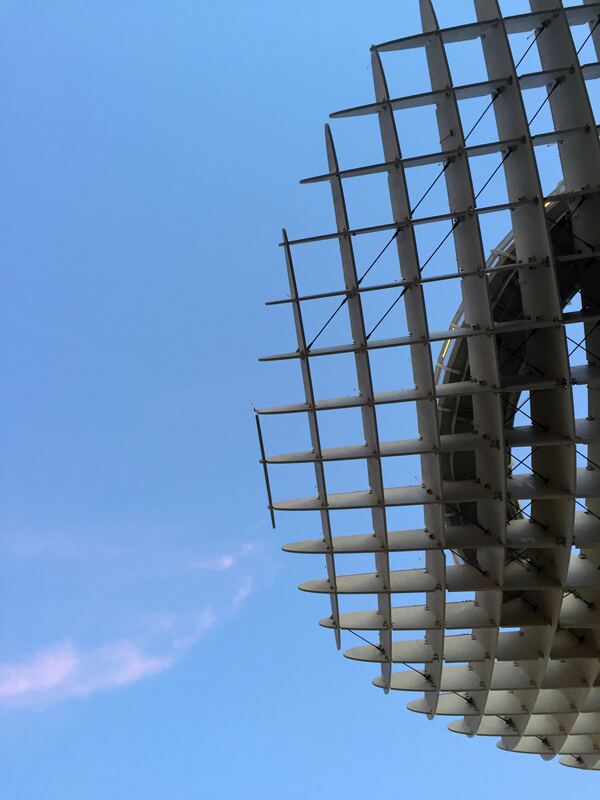 It was designed by the German architect Jürgen Mayer and completed in April 2011. 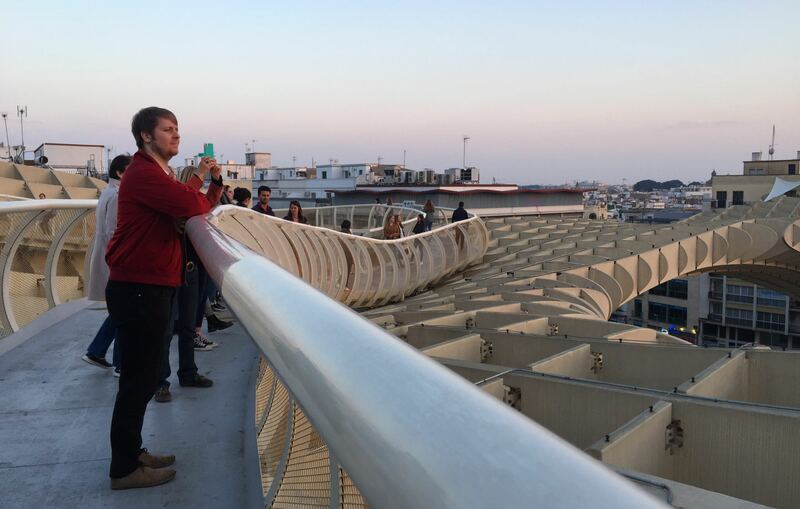 The controversial structure has greatly improved the square, which used to be a car park. 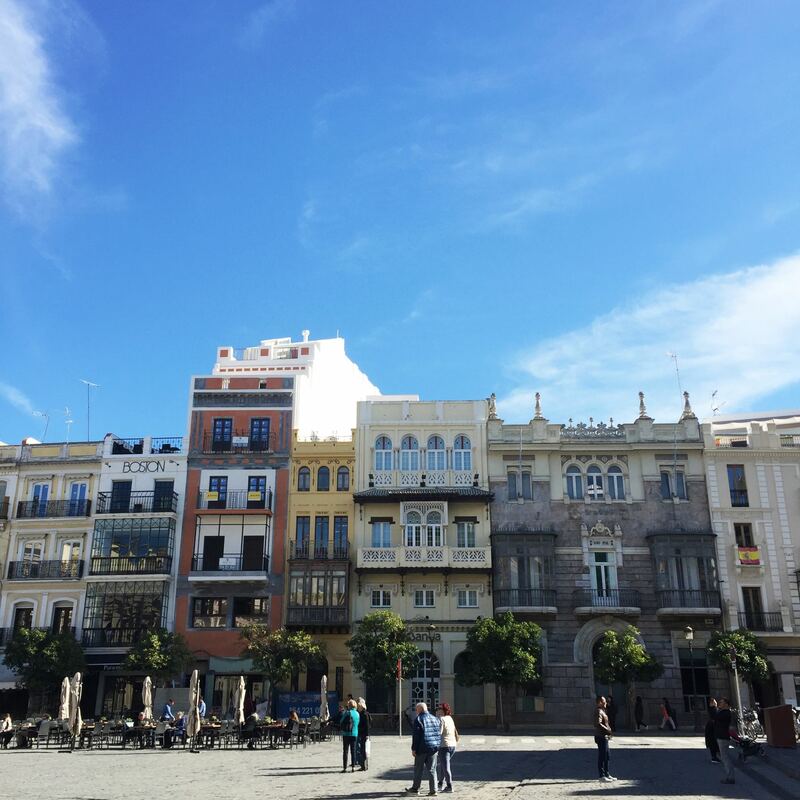 Pretty buildings on Place de San Francisco next to the town hall. 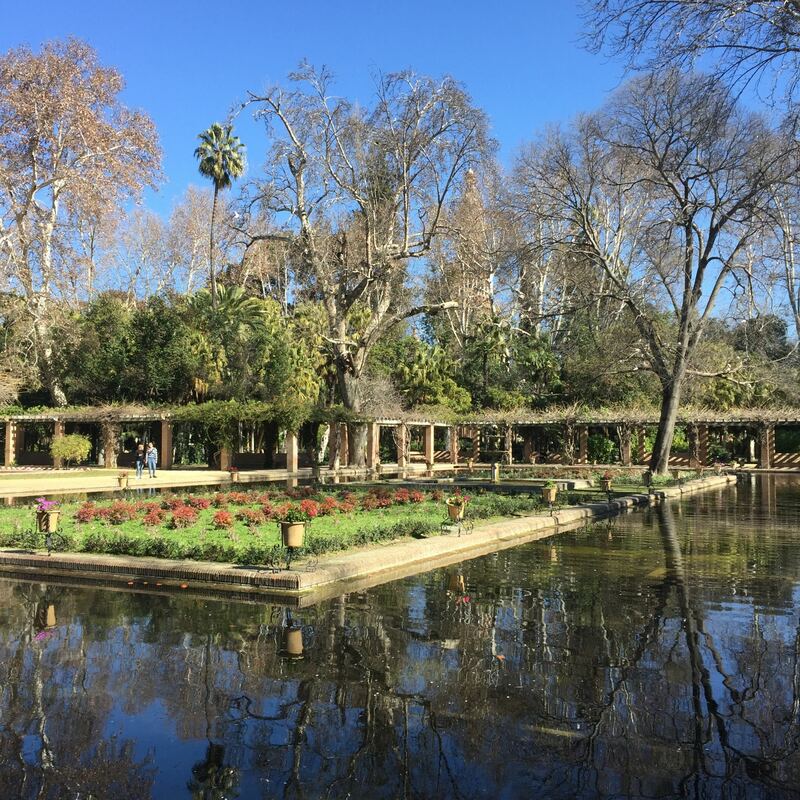 The Parque de María Luisa, Seville’s largest green area. 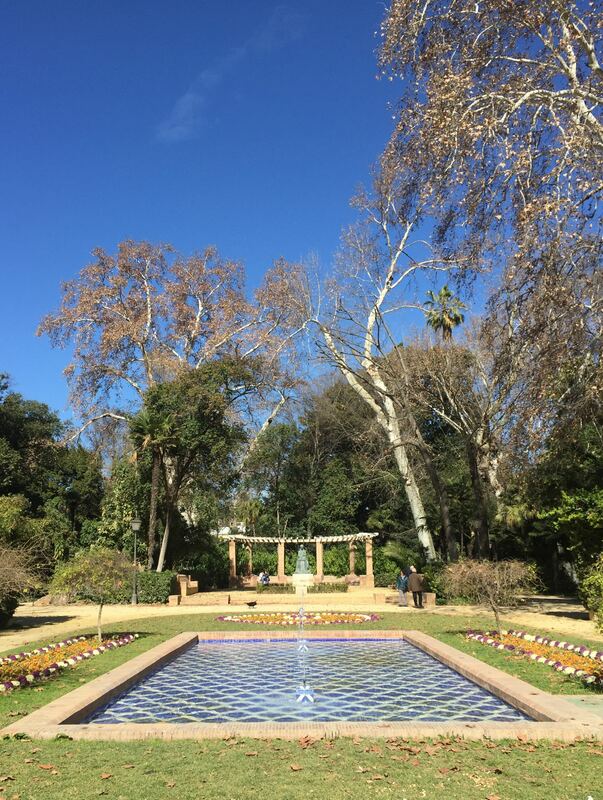 Estanque de Los Lotos in Parque de María Luisa. 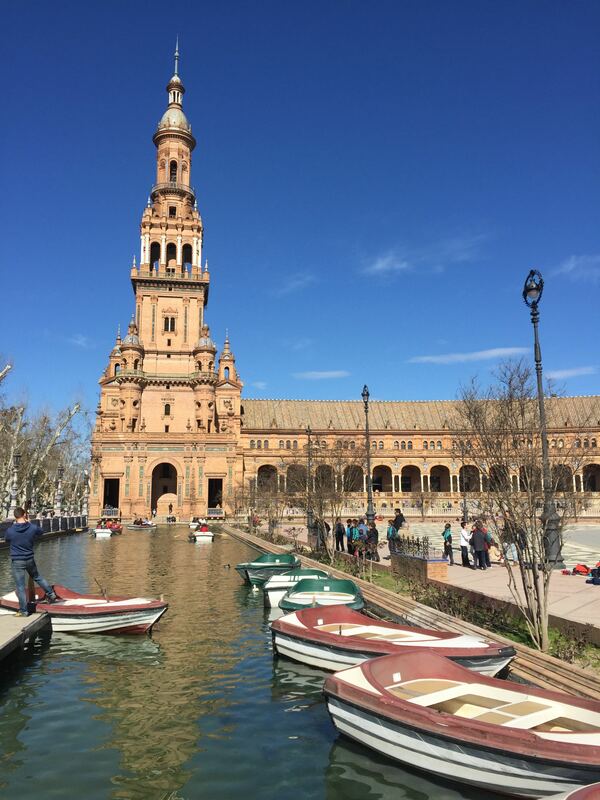 Punting boats moored at Plaza de España. 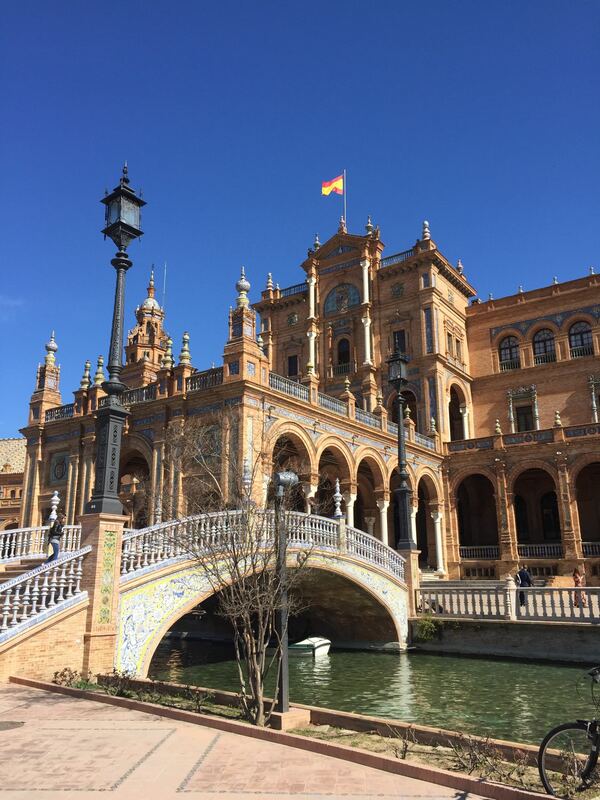 The building houses the Delegación del Gobierno en la Comunidad Autónoma de Andalucía. The ceramic tiled bridge and main entrance to the building. 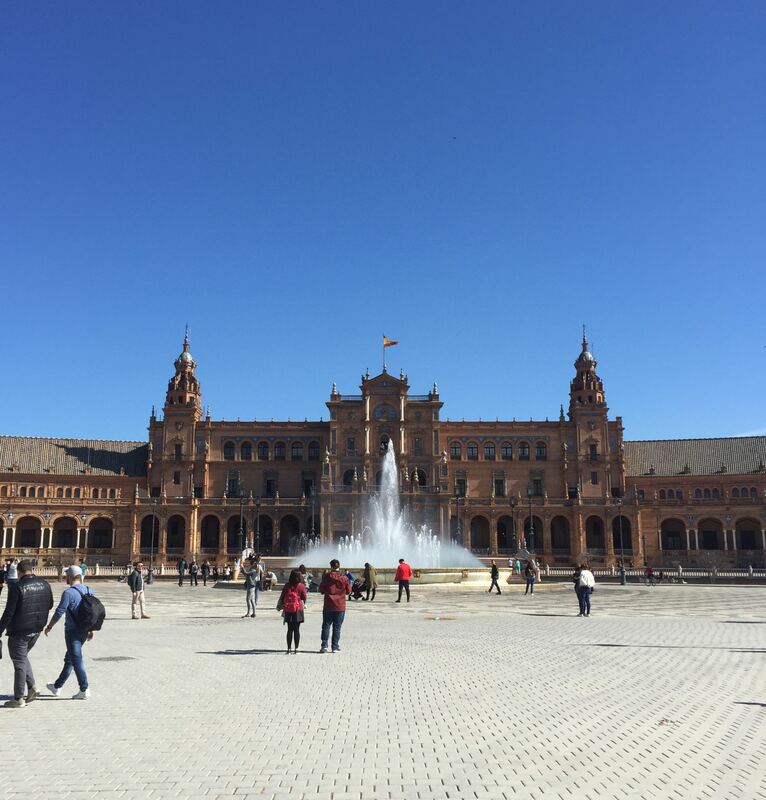 The Plaza de España was built in 1928 for the Ibero-American Exposition of 1929. 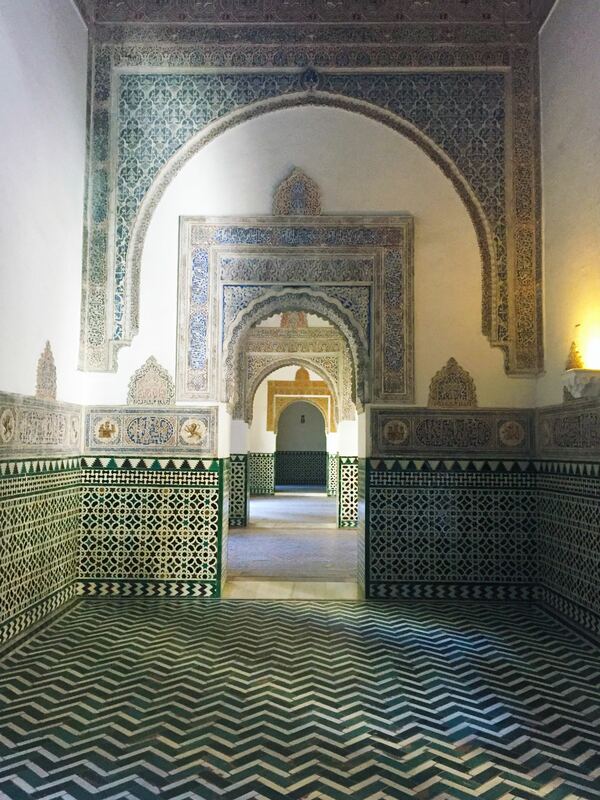 The tiled floors display crests of royal households throughout Spanish history. 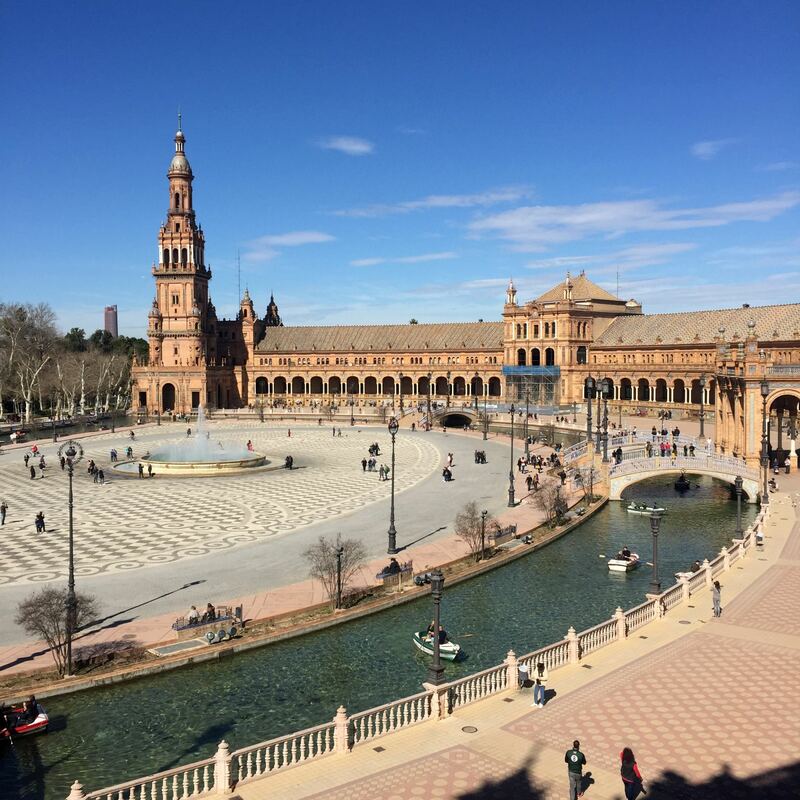 The view over the Plaza de España from the balconies. 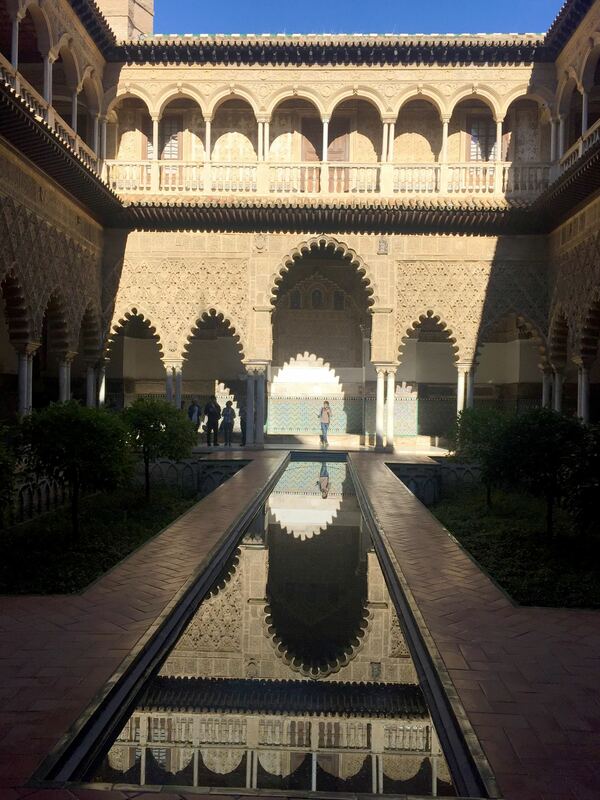 The tiled entranceway where buskers often perform Flamenco. 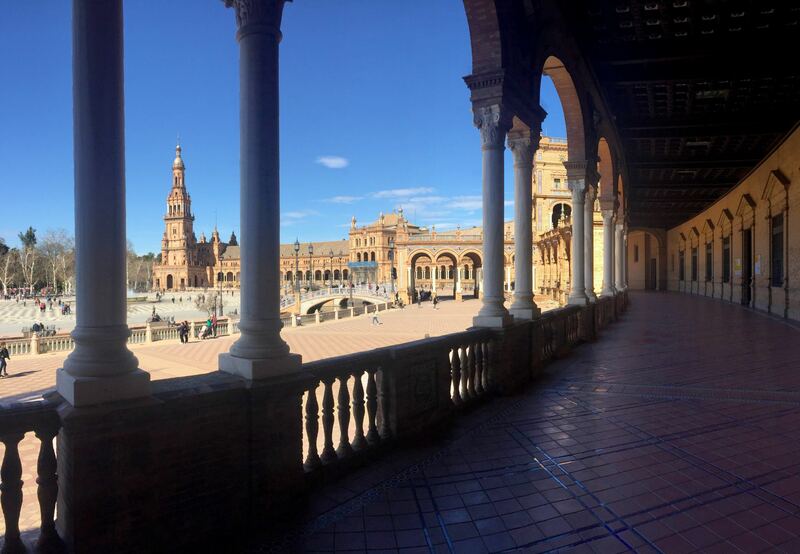 The tiled walkway where they filmed Star Wars Episode II, Attack of the Clones. 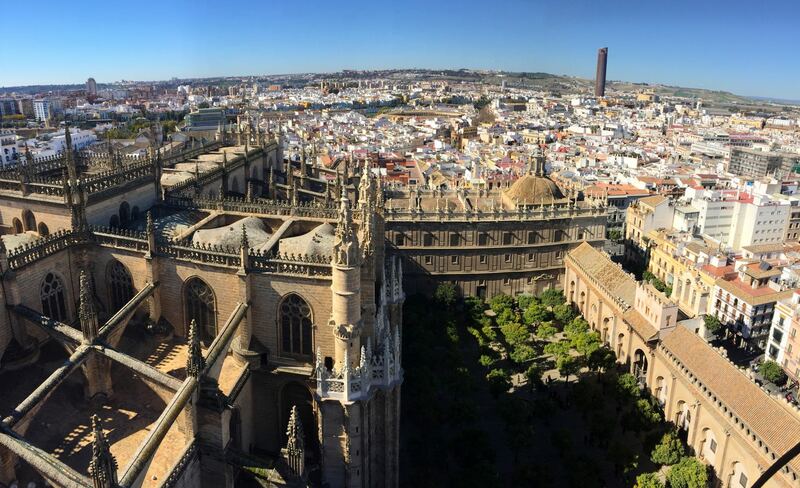 The towering spires at either end can be seen for miles. 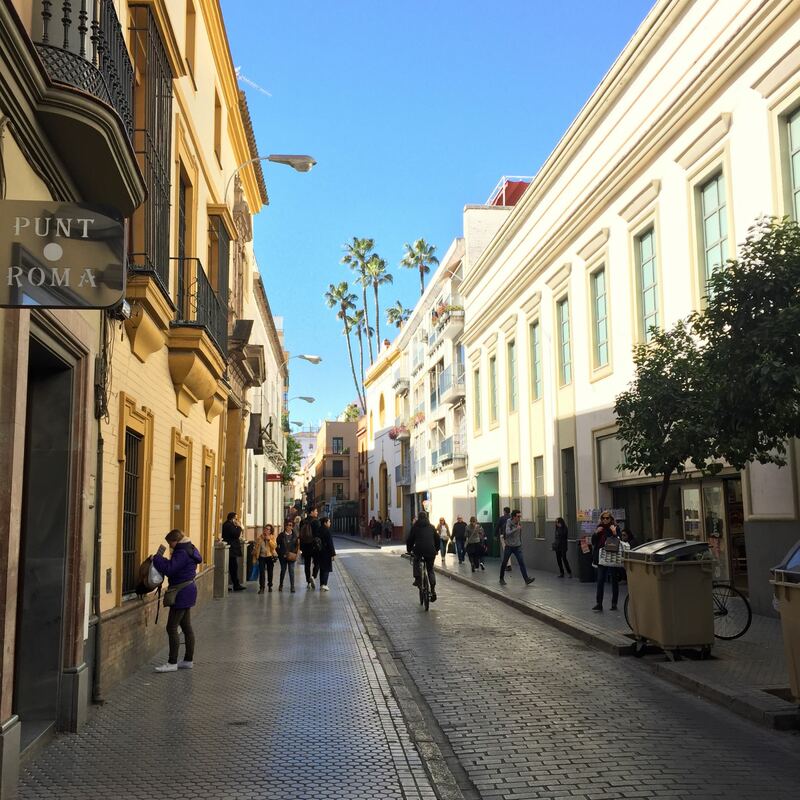 Calle San Fernando by the Universidad de Sevilla. 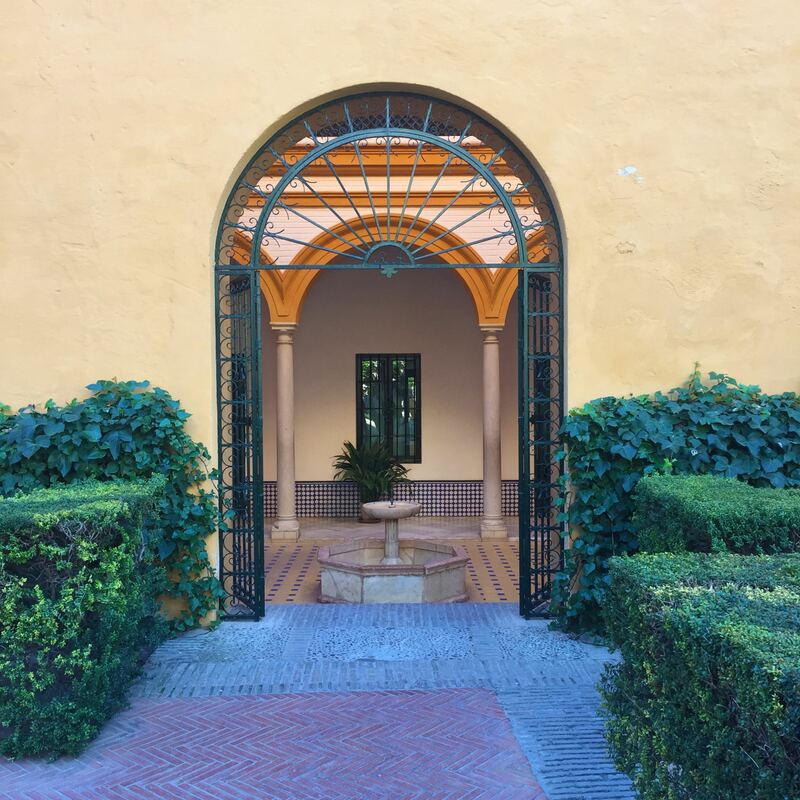 A beautiful courtyard entering the Real Alcázar. 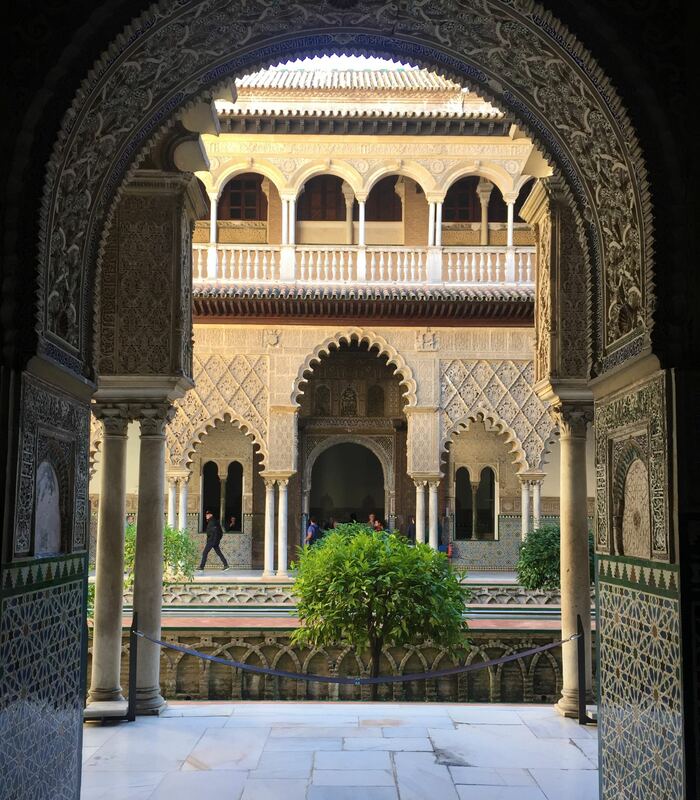 The central courtyard of the Real Alcázar. 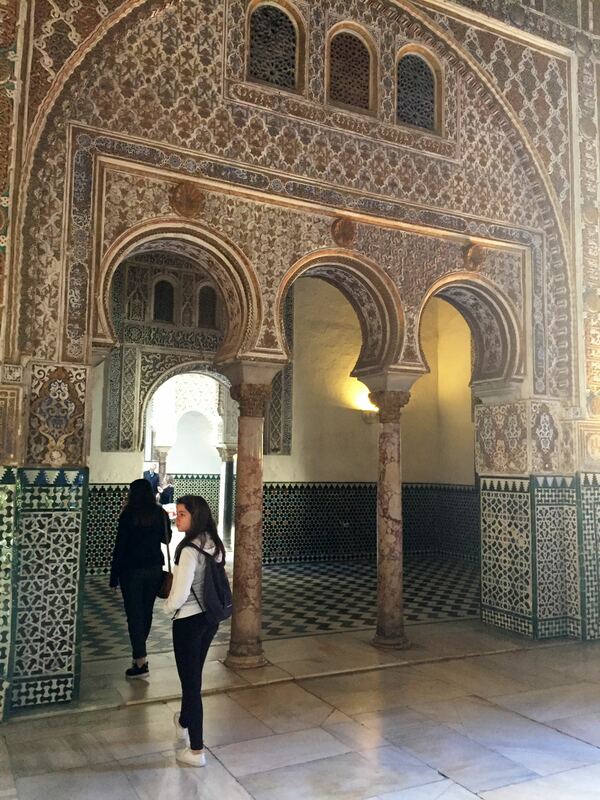 Moorish architecture means lots of tiled archways inside the palace. 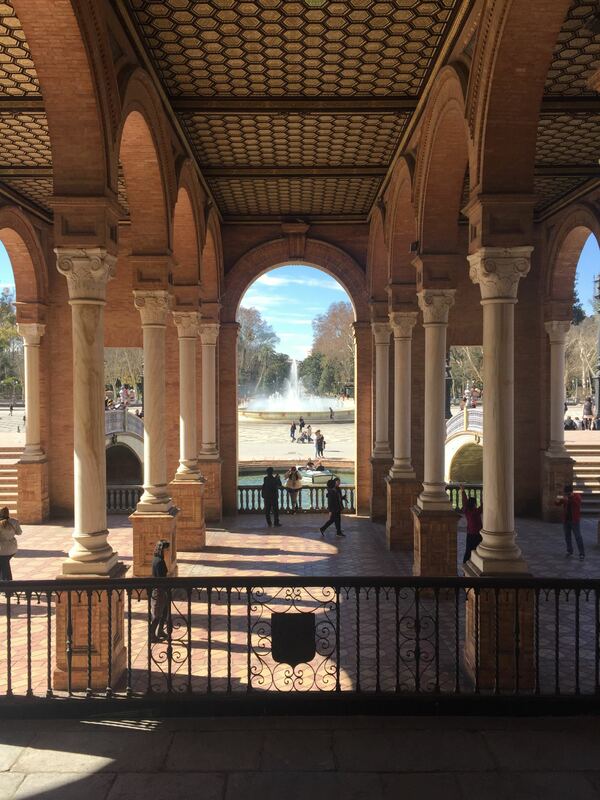 It has a mixture of Christian and Mudéjar architecture styles. 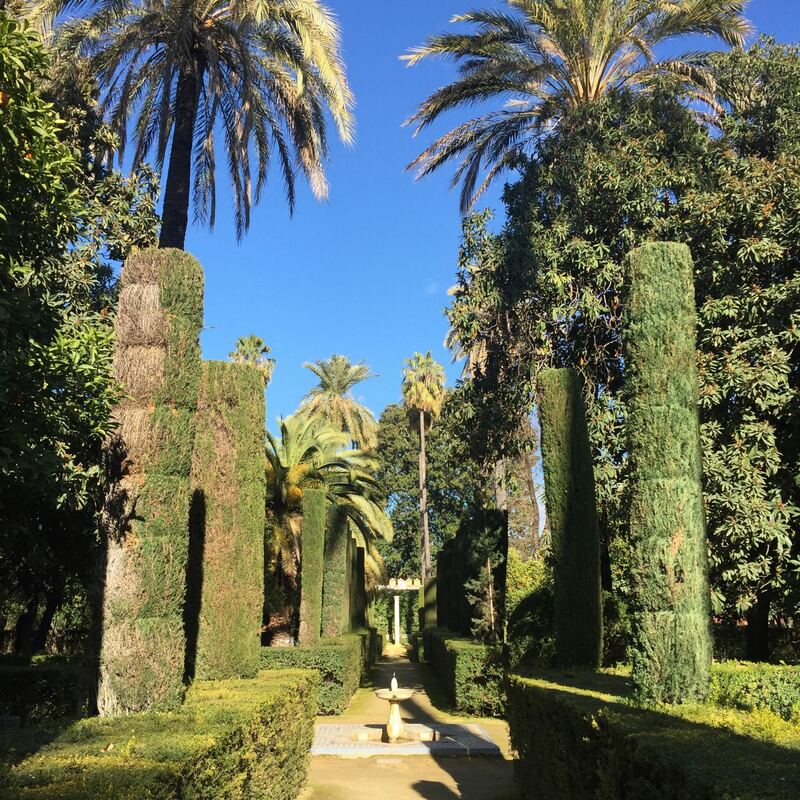 The gardens of the Alcázar, the setting for Dorne in Game of Thrones. 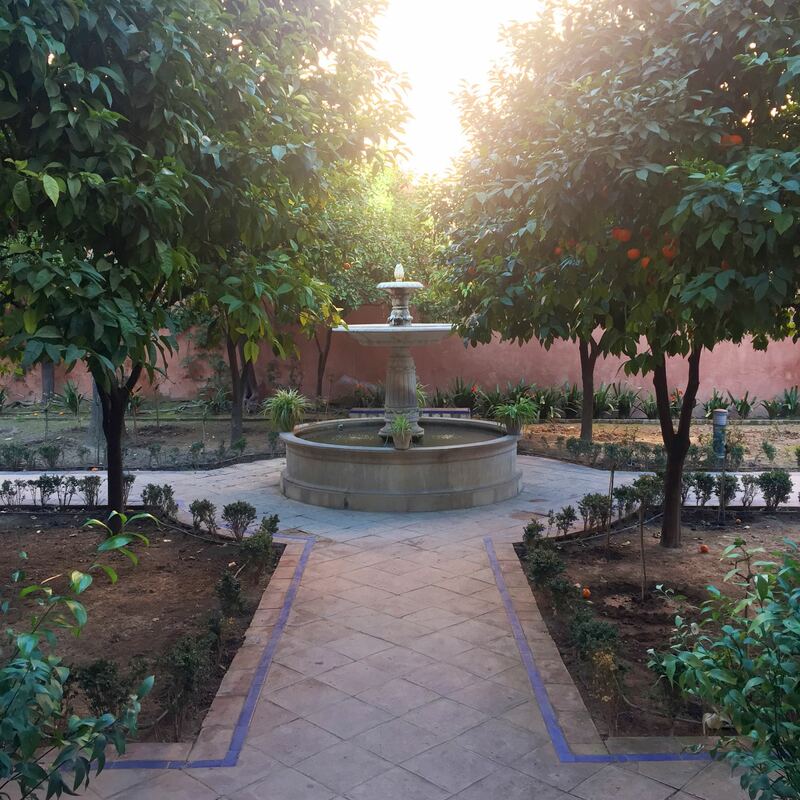 The gardens are framed by grotto-inspired walls. 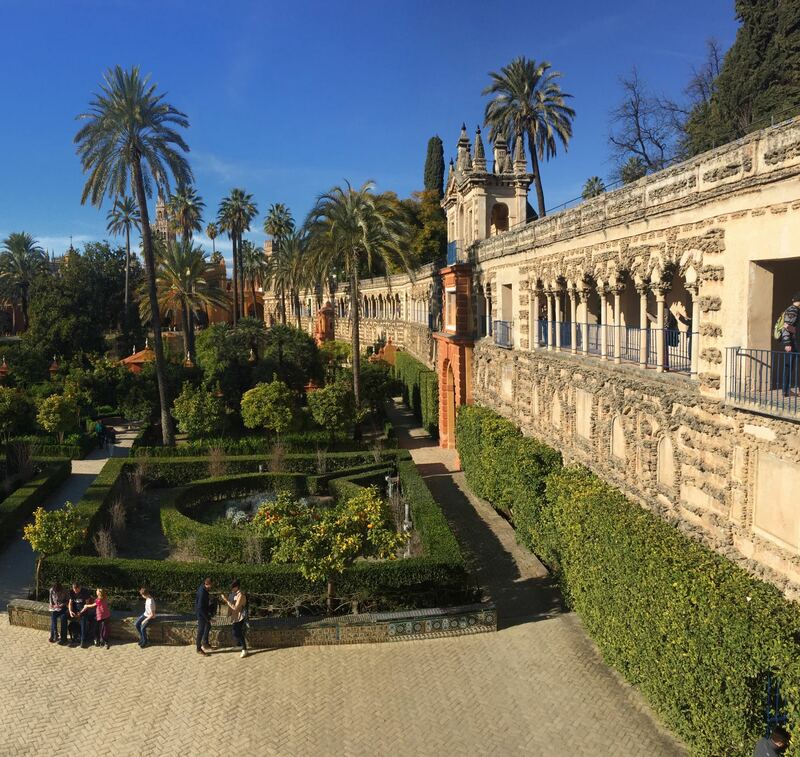 Tip: Book your tickets for Real Alcázar in advance to skip the queues! 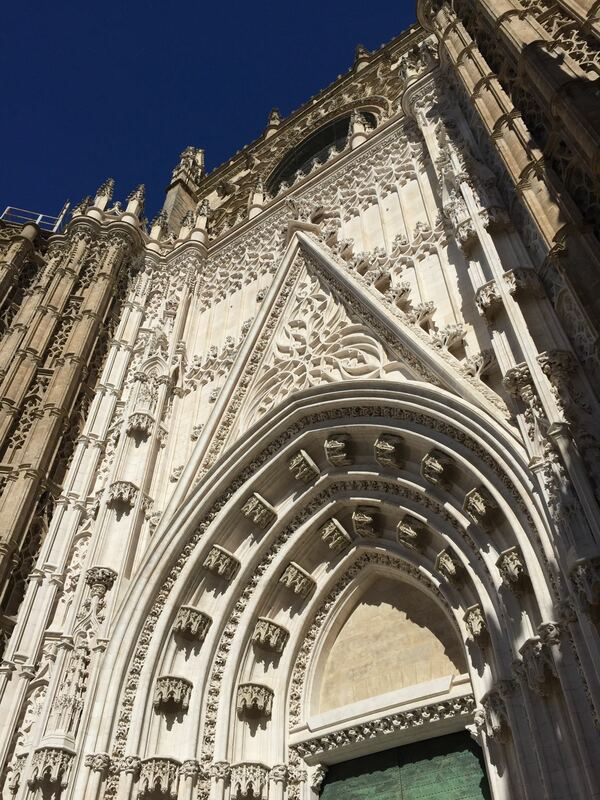 Seville Cathedral from one of the Real Alcázar courtyards. 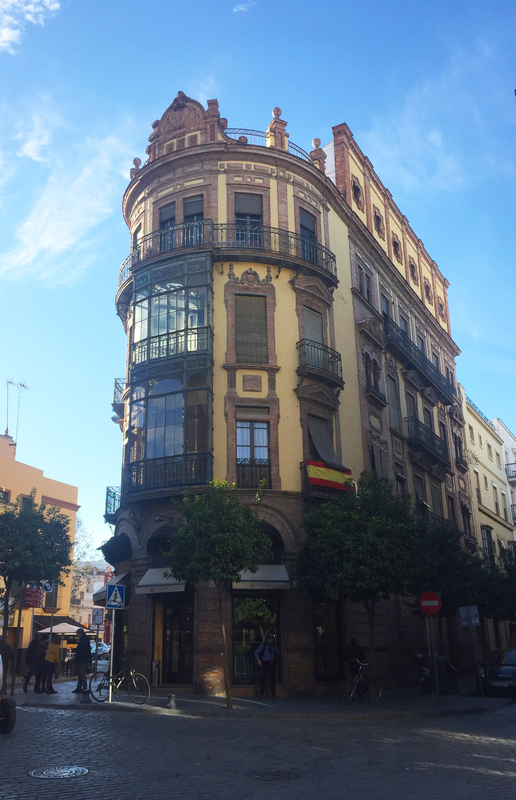 Many apartment blocks around Seville have this style of conservatory on their balconies. Its name comes from the golden shine the tower projected on the river. 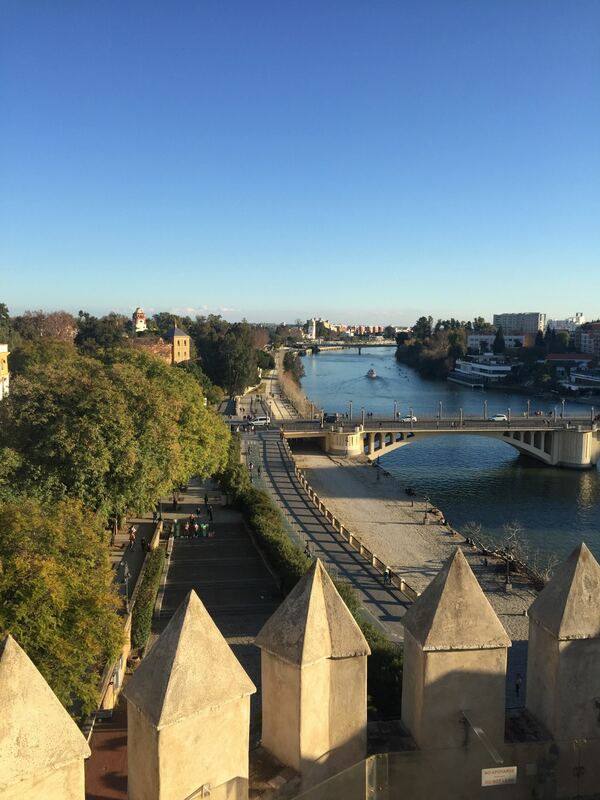 The view of Seville Cathedral from the top of Torre del Oro. 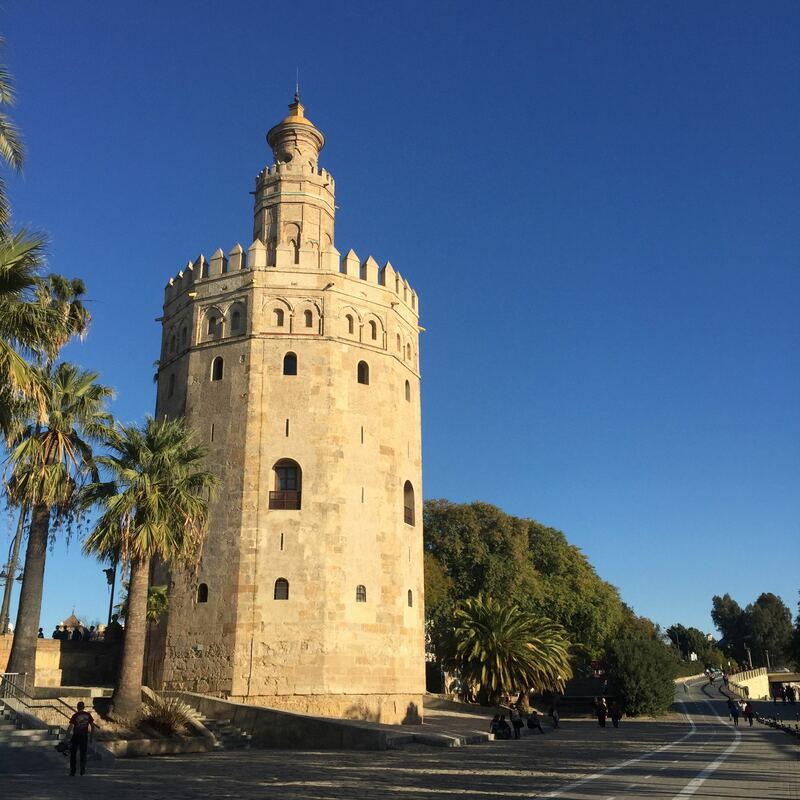 The first level of the tower was built in 1220, the others were not added until later. 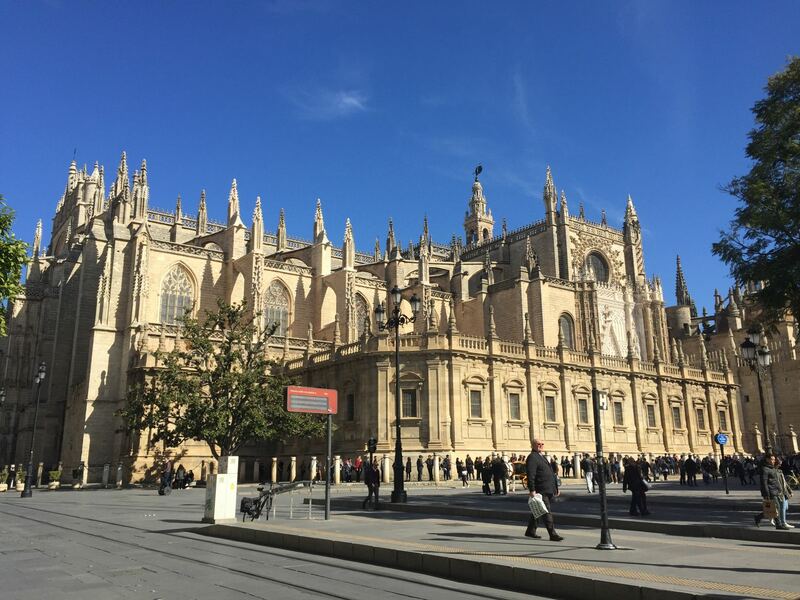 The Catedral de Sevilla from Av. de la Constitución. 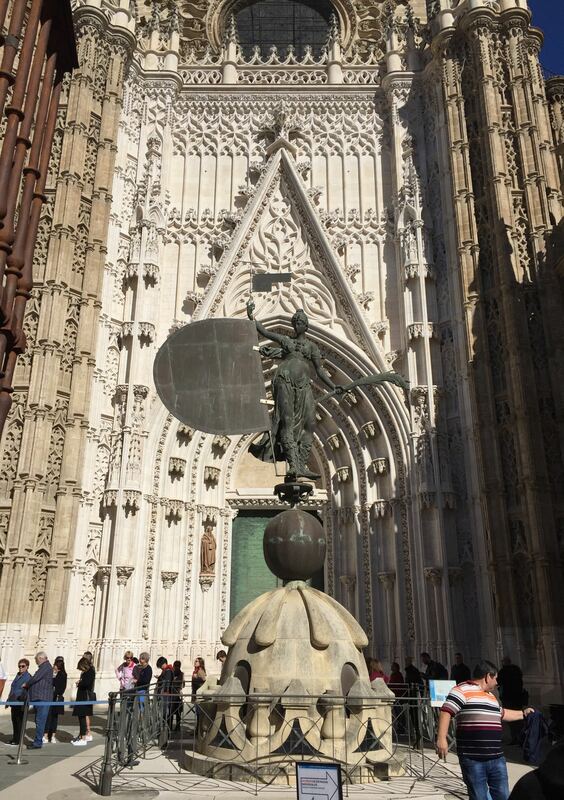 A copy of the statue on top of the bell tower, representing the triumph of the Christian faith. 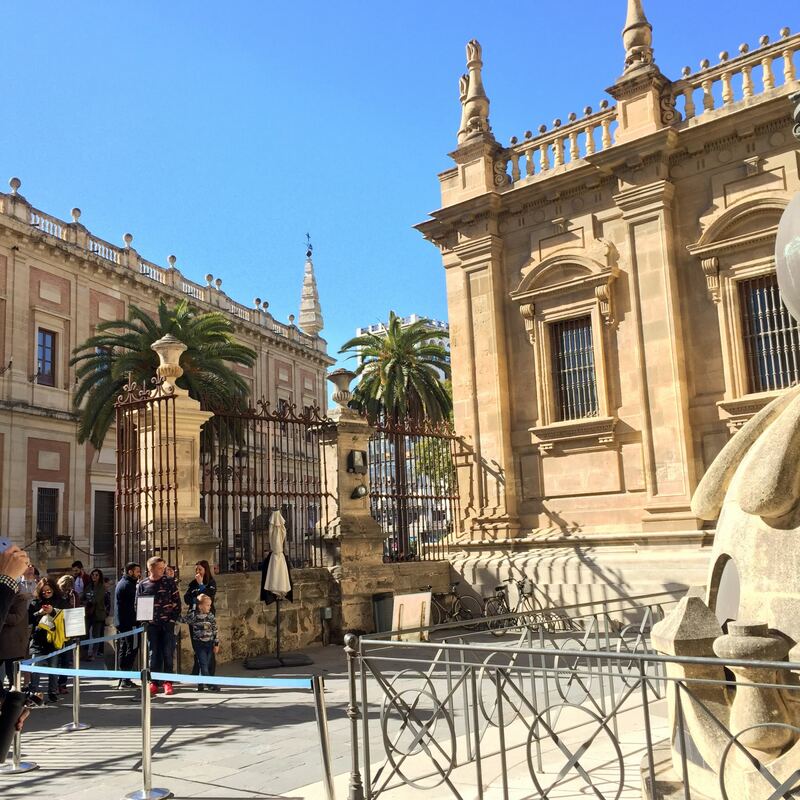 The queue to enter the cathedral – locals get to skip and enter for free. 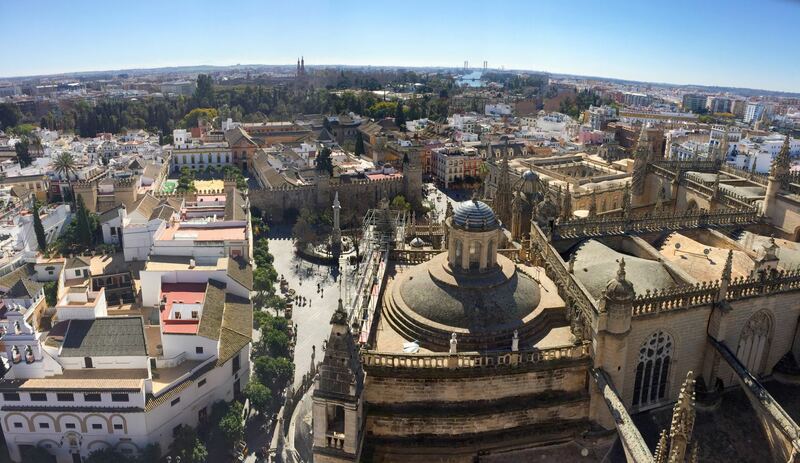 A birds eye view of the Real Alcázar from the Giralda bell tower. The Orangerie inside the Cathedral walls. 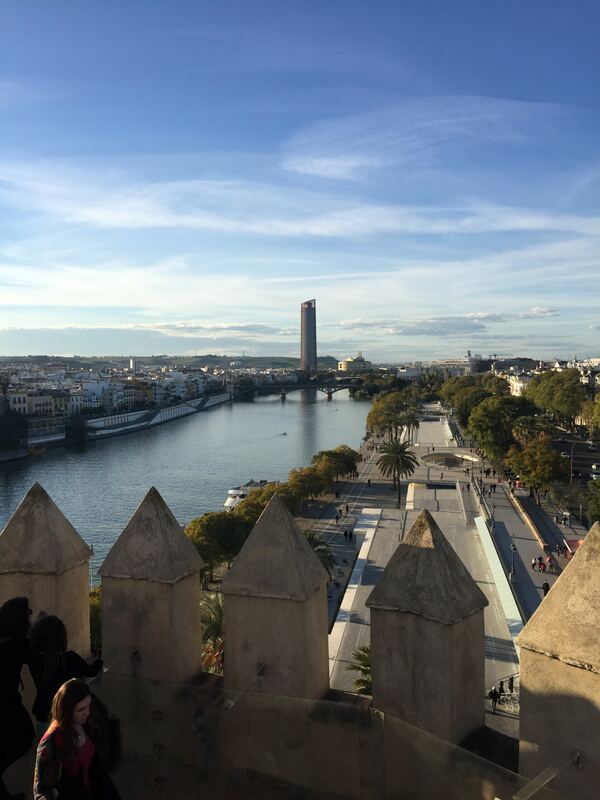 The north of the city from the Giralda bell tower. 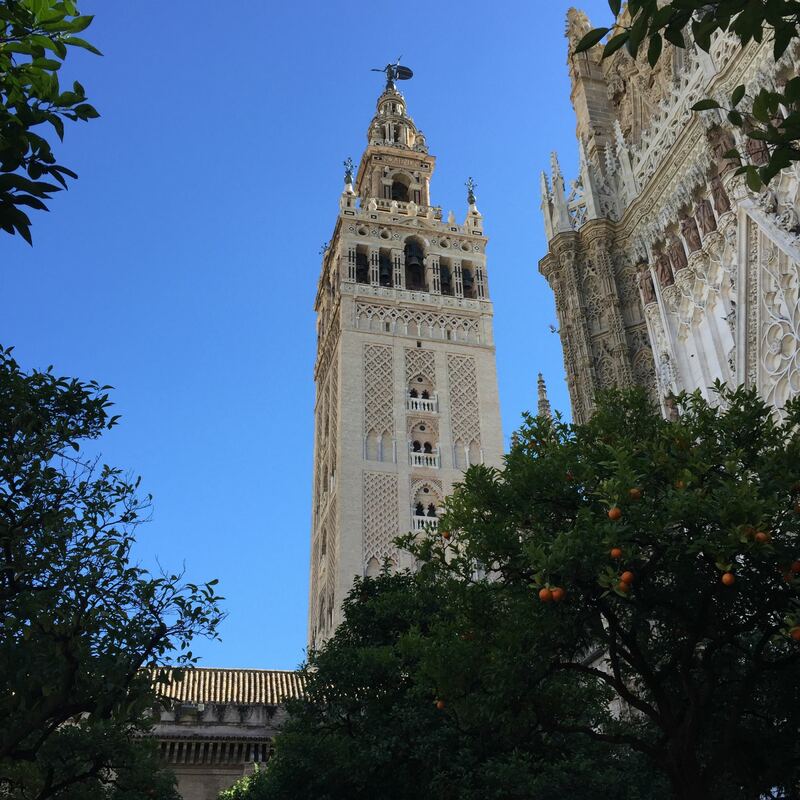 The Giralda bell tower from the Orangerie. The entrance to the Orangerie. 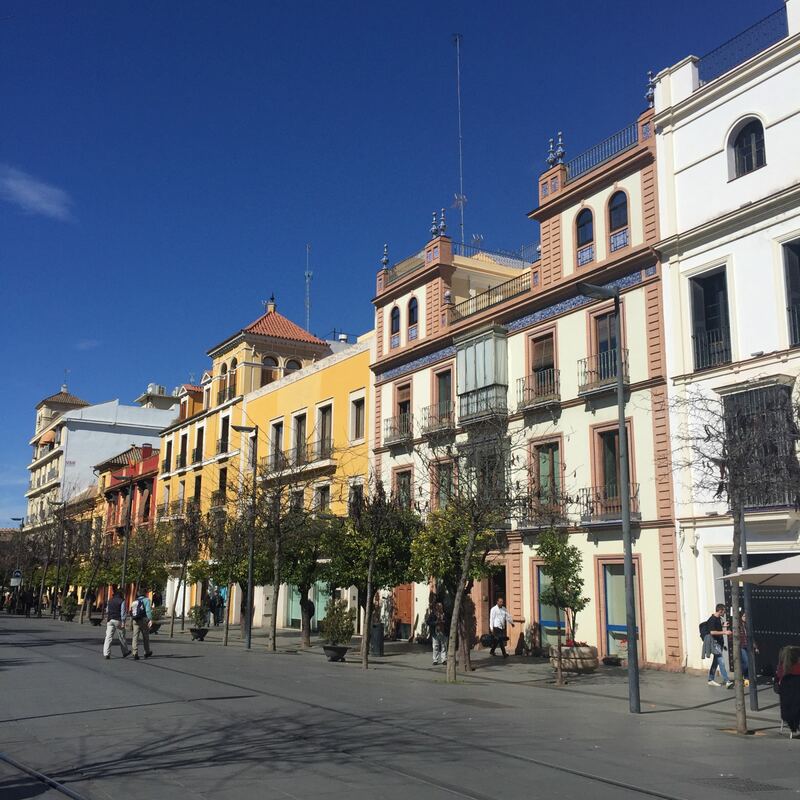 One of the main shopping streets in central Seville. 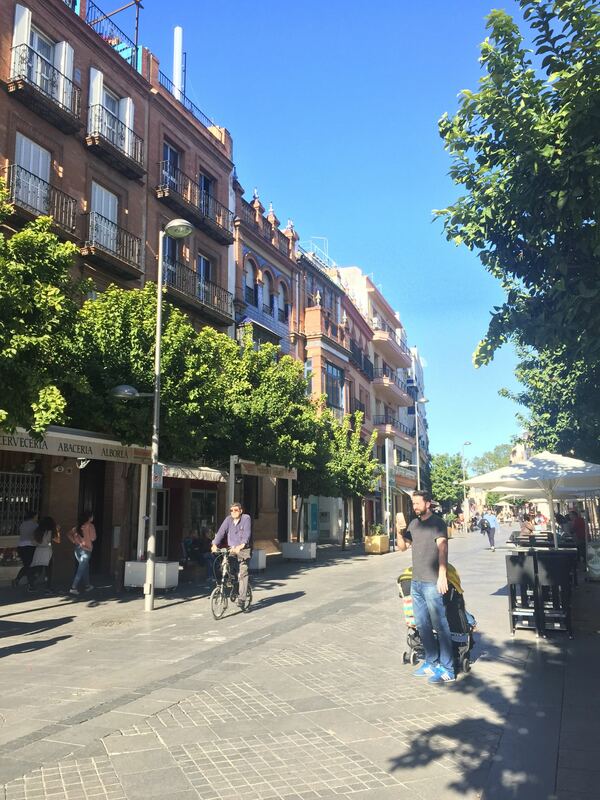 Calle San Jacinto in Triana, the district west of the river. 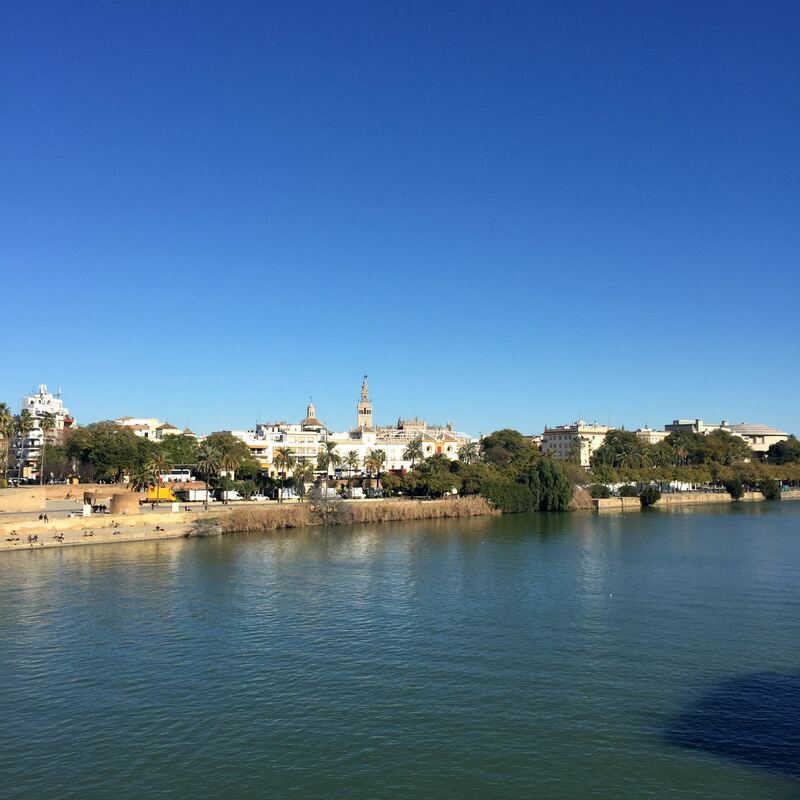 The view over the Guadalquivir river from Triana, with the Giralda in the distance. 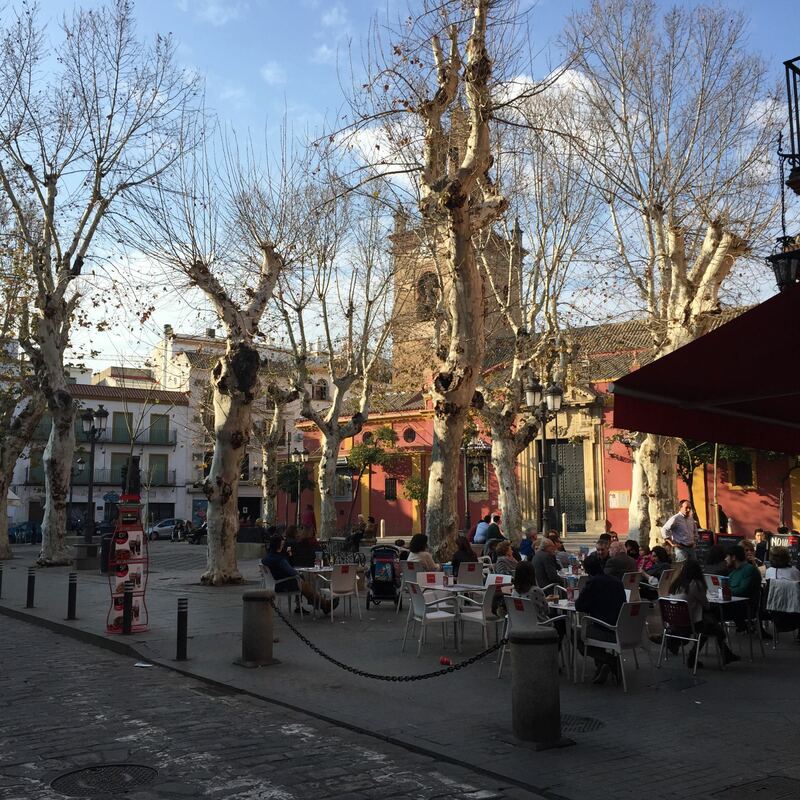 Enjoying a bottle of Rioja at La Brunilda Tapas Bar. 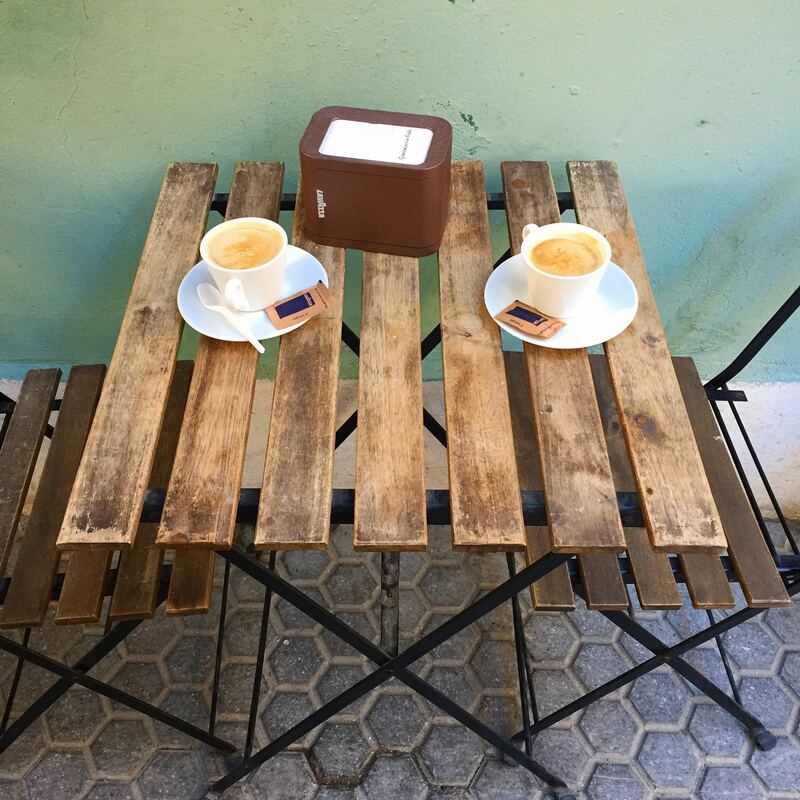 Coffees outside the small breakfast bar Pikislabi before we catch our flight home. 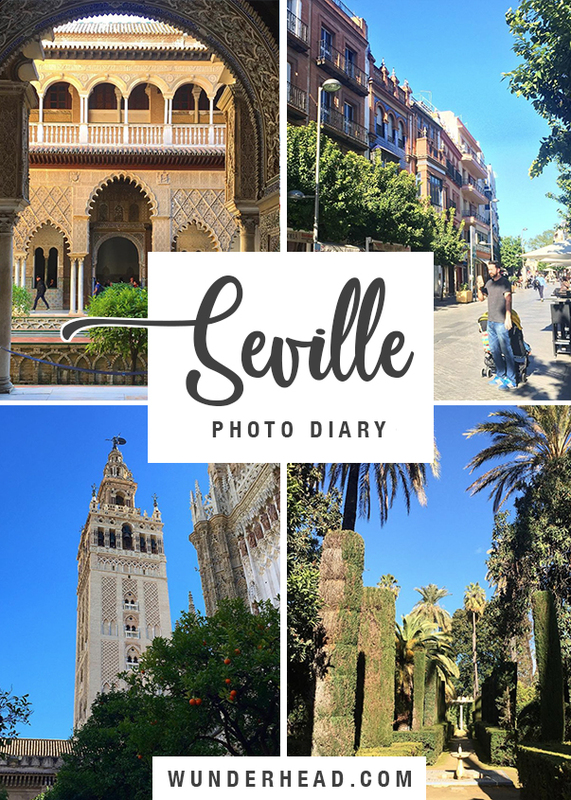 I hope you enjoyed my Seville photo diary! 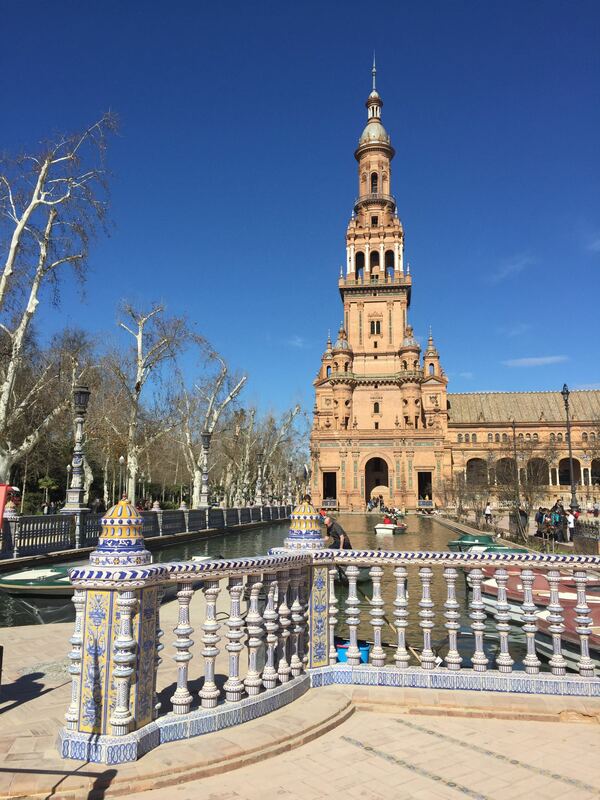 Have you been to Seville before? What was your favourite thing you saw?